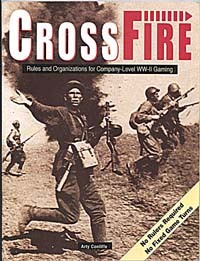 Crossfire is a set of rules written by Arty Conliffe for a game simulating World War Two battles on a company level. I have been playing this game for a couple of years now, and I love it. Never entirely satisfied with any set of rules without a bit of tinkering, I have made various additions and alterations to the rules, and I usually play the game on a scale not intended by the author, where one figure represent one man, rather than one base of three figures representing one section or squad. The game I play, though, is essentially the same game and I hope that these pages are of some use to Crossfire players, players of similar games, and that they might even get someone who has no knowledge of wargaming interested in finding out more. Here are presented various aspects of Lloyd's work on Crossfire. Click and be comparatively happy. You can also click here to download Lloyd's rules additions and alterations (Rich Text Format file). These are in note form at present, are in desperate need of updating, and will only be intelligible to players familiar with the game. Or click here for John Moher's CF site.